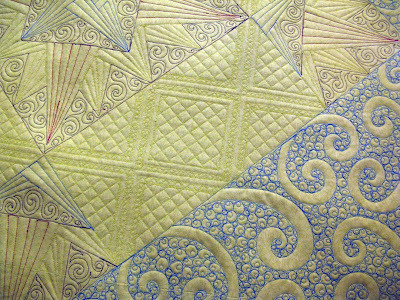 The quilt patten is from Carol Doak's book, Mariner's Compass Stars. The pattern is the Fire and Ice quilt that is in the book. 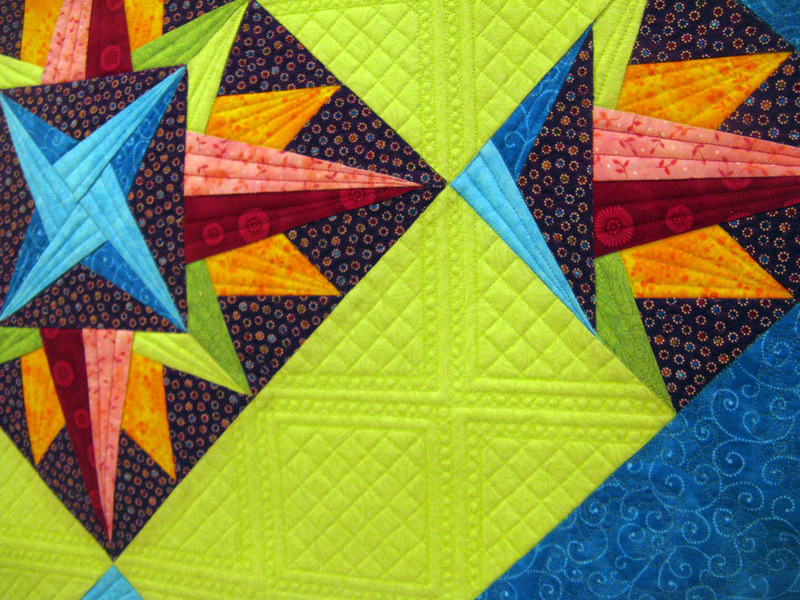 I modified the quilt slightly by reducing the star featured in the middle and added it to the four corners of the quilt instead of a solid square that the pattern called for. 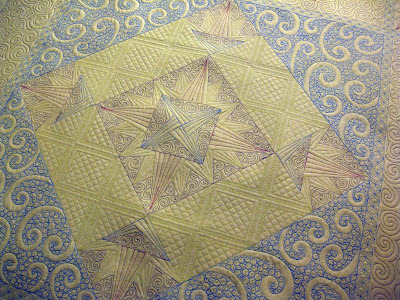 I began making the quilt in a class taught by the queen of paper piecing, Carol Doak herself at the Lowell Quilt Festival in Lowell, MA. Most of the fabric is Timeless Treasure's Jacobean Arbor line which I've had for a few years now and is hard to find at this point. The rest is mostly Mark Lipinski's Elements line with a few additional blenders added in. 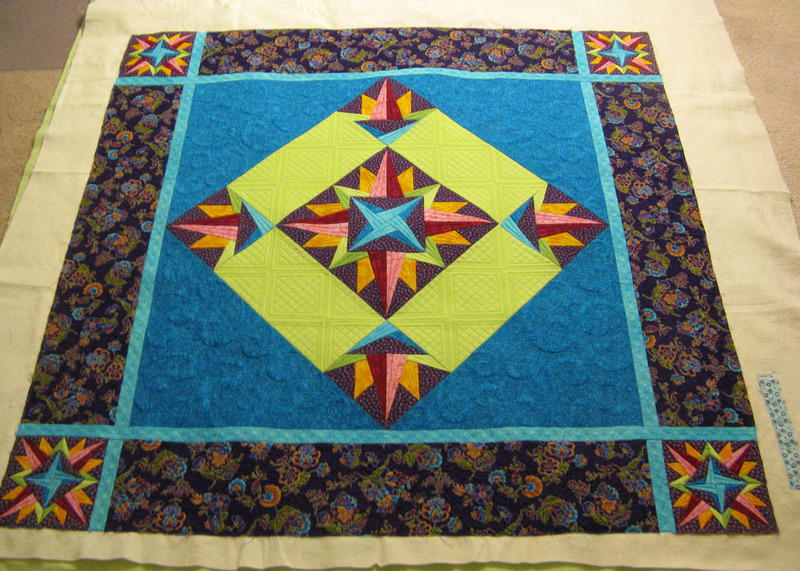 Here you can read about when she finished the quilt top. Anyway - Jen's quilt! She did a marvelous job on this quilt and it was so fun to work on. I used So Fine thread from Superior Threads, and this little quilt took me 13 hours to do. Since I took these pictures at night, I couldn't get the right coloring in all the pictures - but I did some swirls with circle filling for the turquoise fabric - that was very time consuming, but I love the effect it gives the quilt. 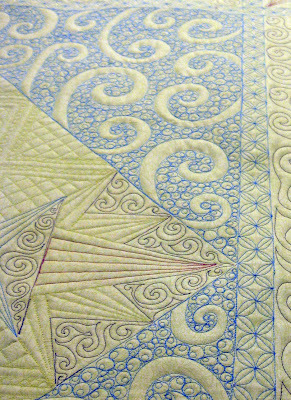 This coloring is much better and you can see the awesome effect of the quilting in the green - also time consuming, but worth it. I love it! I just marked the quilt with a disappearing purple marker and I used my 9 inch ruler to do the rest. It worked out so nicely because of how well Jen piece this quilt. It was very straight. Okay - the back - I love it! I can't tell you how fun it is to take a quilt off. Every time I pull off a new quilt I get a huge rush of satisfaction knowing that "I did that." It really is so fun to quilt! So inspiring! I love you style. Amazing Amazing Amazing What more can I say. Your quilting takes my breath away.. You are simply AMAZING. 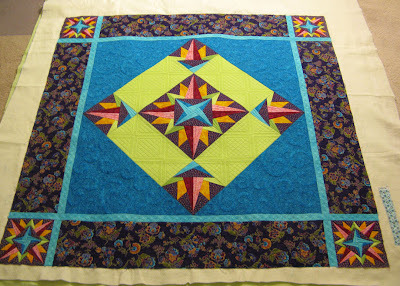 Judi, I LOVE looking at your quilting...it is so BEAUTIFUL...you are truly an artist. WOWSERS! I love the swirls and the little squares look new and so fun! Judi, if I could do work half as good as what you do, I would be totally happy. This quilt is amazing...the back is soooo awesome. Amazing! The detail and perfection of your stitching is truly amazing! 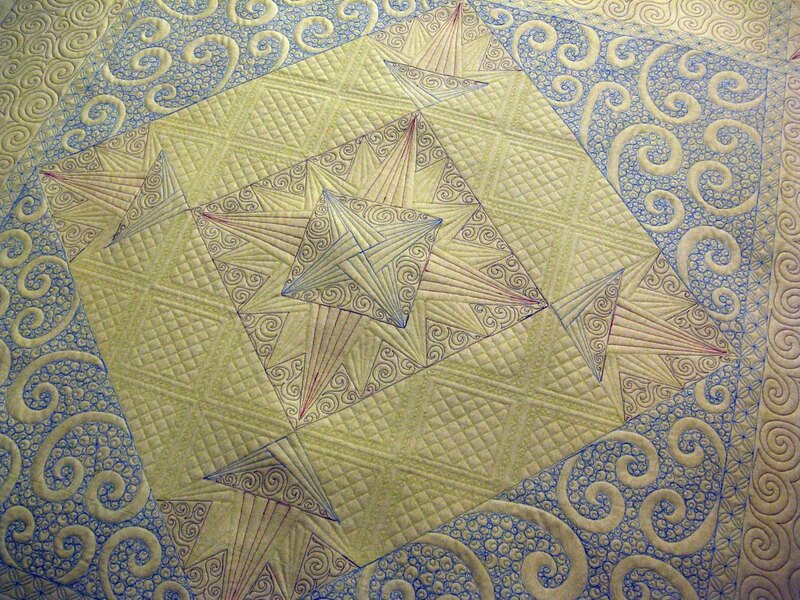 After doing only a few quilts on a long arm, I can just imagine the patience and control it takes to get this kind of fine detail. Not to mention all the thread changes! I love the back almost as much as the front! It must feel so cool to run your hands across the top of it too! 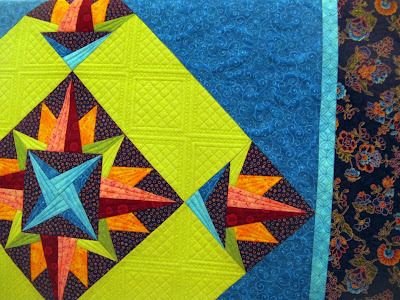 Beautiful quilt and Beautiful quilting! I am always amazed with how you chose to quilt a top. You are definitely artistic! I can only imagine how much fun it must be to take the quilt off and see the back. It is like two quilts in one.....just gorgeous! The back is just a lovely as the front! 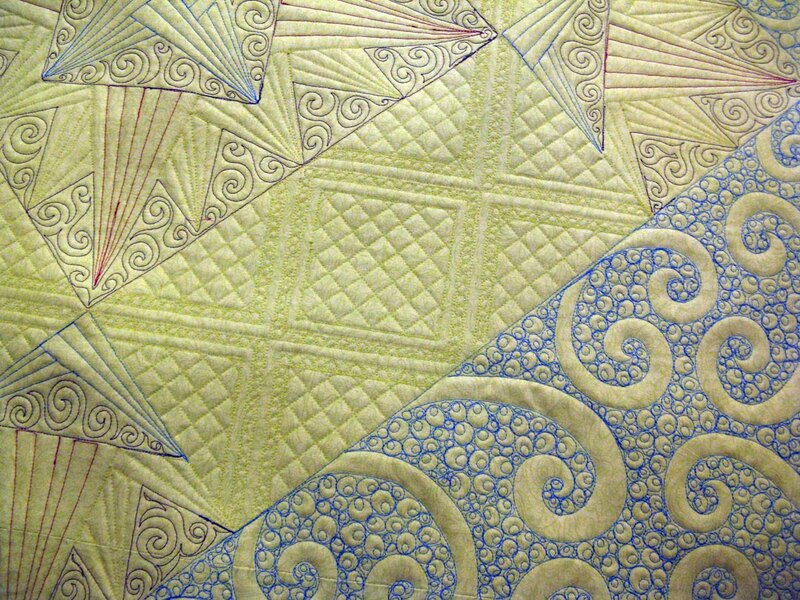 I like Jen's creative changes, and your quilting is as awesome as ever. Amazing, as usual! Thanks for the inpsiring pictures. you really have an eye for bringing designs to life! it's perfetct!!!!!!! what a wonderful quilt is this!!!!!!! j love it so much!!!! This quilt is so beautiful. You do such amazing work. That looks so awesome. When you take the quilt off and get to look at the whole thing I bet it gets you excited to do another one. Thank goodness for that because wow it takes you a long time to do a quilt you probably want like a week long break! 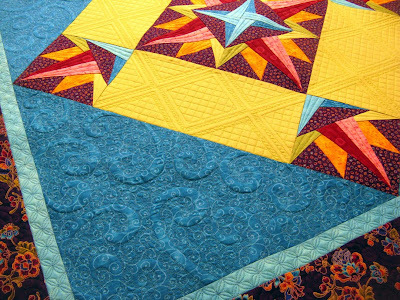 The quilt is gorgeous, and the quilting is exquisite! WOW! The two together is a winning combination. You should both stand up and take a bow!! Wow! I love when the back is just as good, or even better that the front. I know what you mean by the feeling you get when you take a quilt off the frame. Your quilting is wonderful, and I love seeing what you do next. You have a terrific talent. Just stunning! Is it rude to say I like the back better than the front? Probably is. I love, love, love it.....I love the back and the front.....di I say 'I Love It'! It is just as gorgeous on the back as on the front...wow! You just amaze me with all your ideas. Your blog is the first one I look for each day - such beautiful, inspiring work. 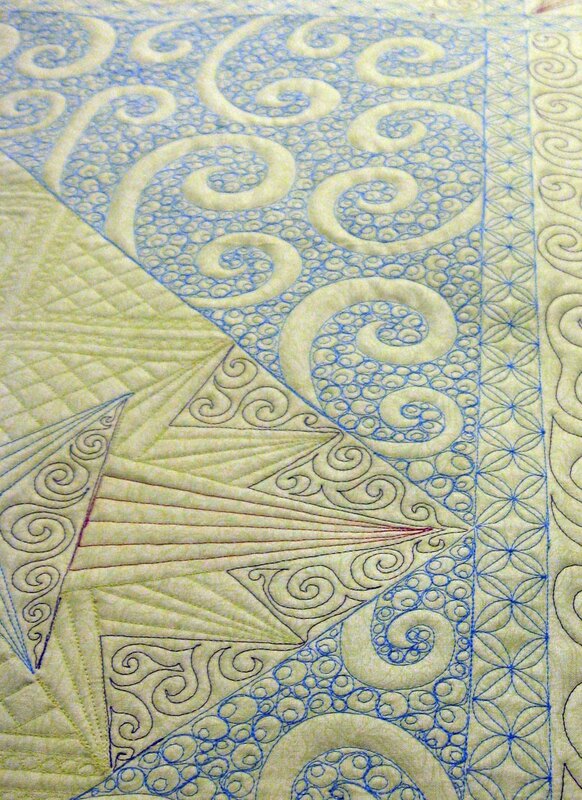 I usually do my own quilting on my domestic machine, and I'm getting ready to quilt a one inch border. I love the design you used on this one and am trying to figure out how you did it. Did you do each little flower/star completely before moving to the next one? Did you mark the spacing? I'd love to know how you did it if you don't mind sharing! This quilt is inspiring! 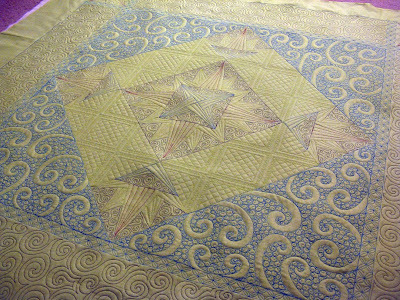 The top is beautiful and I can't begin to express how the fab the quilting is! I would drive the six hours I live away from you just to have one quilt top look this fantastic. Keep it up and I will!! !